Does your home flood often? Is your home or basement ridden with extra moisture? Many homes are often settled below the water lines, making for an uncomfortable living situation. If your home is experiencing a situation like this, call us today to talk about the installation of a sump pump. 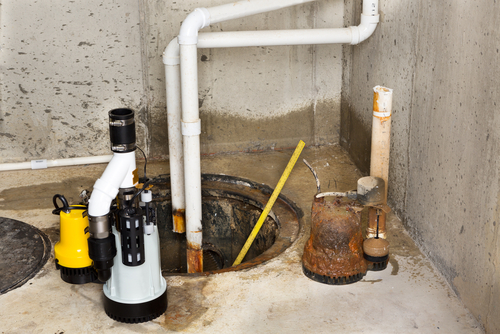 SUMP PUMP INSTALLATION: Sump pumps are great to fight off excess water and moisture in and around your home. They can prevent a lot of damage to your home when installed properly. SEWAGE OR EJECTOR PUMPS: Along with excess moisture comes hazardous living situations. Don’t let your home or office building suffer due to faulty sewage pumps.. Call the expert plumbing technicians today to get a quote on ejector or sewage pump installation or repairs today. Just because your sump pump is working properly does not mean you are not at risk of flooding. Sump Pumps work off of power (electricity). What happens when the power goes out?? Your sump pump does not turn on to do it’s job. A Battery Back-Up System is the only way to help prevent a flood from happening should you lose power. Pink Plumbing & Sewers can test, repair, replace or install a new Battery Back-Up System for you to help ease your mind.